If you're visiting New York City on holiday and need a break away from the crowds and chaos, spending a few hours at the Brooklyn Botanic Garden can be a wonderful change of pace. It's especially lovely to visit in the springtime when so many flowers and trees are in bloom - as I had the chance to do recently while in the city for a weekend getaway. Here I'll share some photographs from my visit as well as tips and information for planning a trip to the Brooklyn Botanic Garden yourself. If you love natural wonder and beauty it is definitely a must-visit destination when in the NYC area. Flowering trees along the Japanese Hill-and-Pond Garden. Have you ever been in the Springtime...or otherwise? The Brooklyn Botanic Garden was founded in 1910 and today covers 52 acres of land along Flatbush Avenue in the borough of Brooklyn. There are over 12,000 species in the Garden which welcomes over 725,000 visitors annually. Residents of the nearby Prospect Heights, Crown Heights and Park Slope neighborhoods along with tourists from around the world seek natural beauty and tranquility at the Garden, which has numerous unique plant collections, specialty gardens, a greenhouse pavilion and so much more to enjoy year-round. Have you ever been to the Brooklyn Botanic Garden? Yes, many times. I love it there. I've been there once or twice. I've never been there before but I'd love to visit in the future. I haven't been there and probably won't go...gardens aren't my thing. Elegant cascading wisteria blossoms ...even on the incredible Wisteria Bonsai tree! Originally plans for Prospect Park were for it to straddle Flatbush Avenue, when the land was purchased by the City of Brooklyn for this purpose in 1864. However, Frederick Law Olmsted and Calvert Vaux's final plans for the Park eliminated this problem by instead utilizing the land northeast of the Avenue as an "ash dump". Sounds lovely, doesn't it? However as the city moved toward consolidation of the boroughs in 1897, 39 acres of that ash dump were set aside for the purposes of a botanic garden, which was finally founded in 1910. It opened to the public in May of 1911, making the Brooklyn Botanic Garden now over 100 years old. Harold Caparn was the primary landscape architect of the Garden and responsible for many of its major landscape elements today, including the Osborne Garden, Cranford Rose Garden and Magnolia Plaza. There are still expansions being made to the Garden today. The BBG is involved in scientific research, youth education, and also community outreach to help neighbors of the Garden "green" their own environments. You can learn more at the Brooklyn Botanic Garden Official Website, including what's currently in bloom and what special events are coming up on their calendar. The Japanese Hill-and-Pond Garden is the first Japanese garden created in the United States, in 1914-1915. This guidebook is essential for anyone who wants to explore and truly appreciate both the Botanic Garden and neighboring Prospect Park. Although Central Park in Manhattan usually gets more attention, many consider Prospect Park superior in landscaping, design and natural beauty. If you have the time to really explore while visiting NYC - or perhaps live nearby and have never spent much time in the park - then this is the guide you must read first. Inside you'll find information about more than 100 interesting places to visit and sights to see in the Park, eleven walking tours, 20 maps and plenty of practical information such as locations for restroom facilities and photographs for identifying birds and flowers. Blooming plants in the Rock Garden. The Brooklyn Botanic Garden is open year round except on Mondays and major holidays; hours vary seasonally and the Conservatory closes earlier than the Garden grounds. There are free guided tours on the weekends but it's easy enough to grab a map and simply explore on your own; be sure to wear comfortable shoes as you go walking about! The easiest way to get to the Garden from Manhattan or the other boroughs is to take the subway; the 2, 3, 4, 5 and Q trains all stop near one of the park entrances. There is also a parking lot near the Washington Avenue Entrance. Food and beverages except bottled water and baby bottles are not permitted on the grounds; there is, however, a very lovely cafe serving salads, sandwiches, soups and specialties of the day to stop for refreshment. Want to spend the entire day in the area? The Botanic Garden is right next to the Brooklyn Museum, home of New York City's second largest art collection. There is also Prospect Park across Flatbush Avenue: 585-acres of landscaped and natural beauty with playgrounds, a zoo, the Grand Army Plaza Greenmarket, a carousel and much more to explore and enjoy. As part of their education and outreach programs, the BBG has published a number of guidebooks to help gardening and landscaping enthusiasts bring beauty to their own home environments. Hurricane Sandy caused significant damage and devastation throughout the Northeast in 2012, and the BBG was not spared from the storm's wrath. According to a BBG press release at the time, dozens of trees were felled or sustained significant damage during the storm, including 80-year old little-leaf lindens and a historically important Chinese parasol tree. However, the park was relatively lucky in that it did not sustain more damage and today visitors will see much unchanged from before - save the addition of a new tree house installation built from the wood of trees felled in the storm. Yes, the Brooklyn Botanic Garden is an interesting contrast to the New York one. I think the BBG perhaps has more of a focus on flowers and flowering plants, at least that was my impression on having now visited both in the spring season. 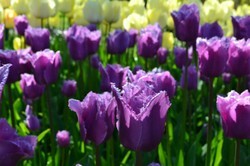 The purple and pink tulips are so beautiful! So Brooklyn has its own botanical gardens, huh? :) It's great for its residents who can use it as a park to stroll and take children out to play and learn something. I enjoyed your article and photos. Thank you for the lovely tour! I live in Denver and I love our Botanic Gardens which are NOT 100 years old. I've heard many good things about the BBC and hope to see it one day.